When he renovated the kitchen in the Victorian house he bought in 2009, Buscemi, who provides historically accurate fabrics, wallpapers, carpets, and trims to museums and historic houses, wanted an old stove. 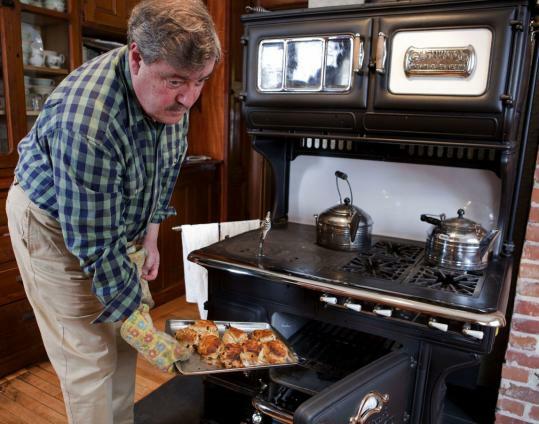 For 40 years, he has cooked on an antique, coal-fired Glenwood at his house in Vermont. He turned to David Erickson, who meticulously restores antique stoves in his Littleton workshop to find one for this Lynn kitchen. “The nice thing about these stoves is you can do a million things that you can’t do on a modern stove,’’ says Buscemi. By removing the two coal burner lids, you can set food directly over the coals and grill indoors. Because the oven is connected to the chimney, all the smoke goes right up it. “You will do steaks better than you can do outside,’’ he says. Getting the hang of it takes a bit of work. There’s building and maintaining the fire (he started the one that was burning in February just after Christmas, and adds coal regularly), emptying the coal bin daily, lighting each gas burner every time you use it, and lighting pilots for both the gas oven and broiler. The heat in the ovens is controlled with drafts, not a simple knob with numbers. When the weather warms up, it’s time to switch to gas.